We started our trip in Northern California so my husband could do his 4th Ironman Triathlon, which he got to complete with his brother. Yay!! It is always an amazing experience to watch these athletes pushing themselves to the limit, a true test of mental and physical endurance. I have nothing but admiration and respect for every single one. They inspire me. 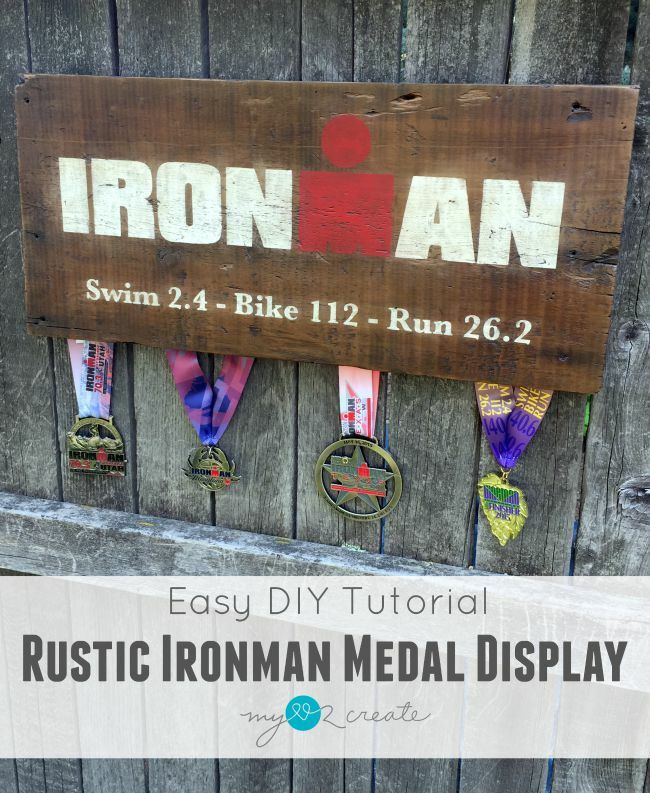 So I thought I would make a Rustic Ironman Medal Display for my husband. 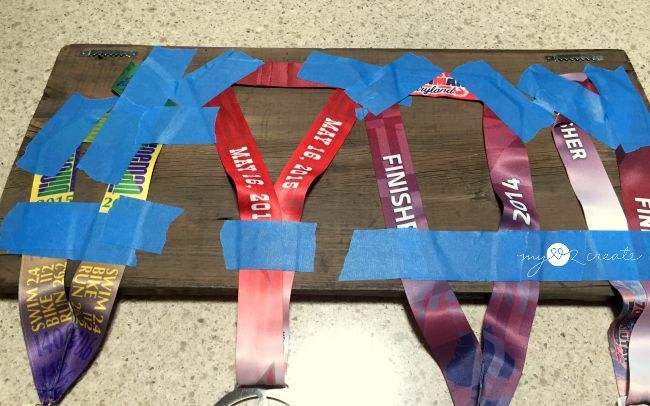 This is such an easy project and would be perfect for any medal collection: marathon, half marathon, triathlon, dance, soccer... really ANY type of medal! It is naturally weathered, and when I brush on a top coat, it brings out all the rich beautiful color and imperfections reclaimed wood has to offer. Pure rustic goodness. Because I have a Cricut, I was able to cut this out using contact paper to make a stencil. However you can totally make this without a cutting machine! Ink transfer method, which I used on my Spooky Halloween Sign. Or good old fashioned pencil transfer signs. Once I had my sign painted and stencil removed, I gave it a three coats of poly, sanding with 400 grit sandpaper between coats 1 and 2, to make it super smooth. Then I used a really high tech method of attaching the medals. :) I know right!? 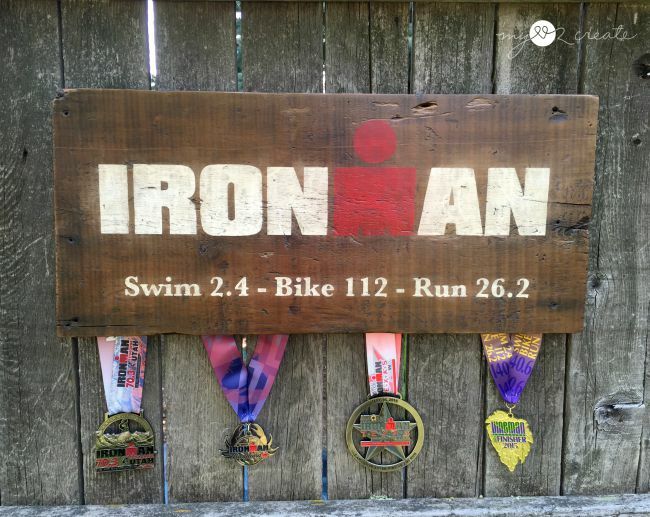 Second, I know my husband will be doing more ironman's so I wanted an easy way to change them up, and painter's tape was perfect. It won't destroy the ribbons, it removes easily, and it was strong enough to hold them up. Perfect!! 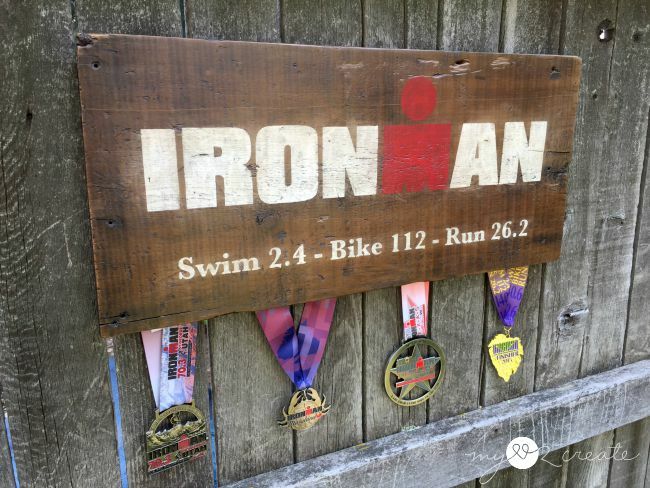 Third, my plan was to put roofing nails (or you could use hooks too) on the front of the sign and just hang the medals on those. I gave my husband this second option as well, and that is what he wanted, so that is what he got. You can't even see the awesome tape job on the back when it is hanging up...hee hee! Probably my favorite part about this sign is how the white lettering looks aged. Let me share how I got that look. After I cut the board I sanded it really well and then wiped off the sawdust with a paper towel, lightly. I went ahead and added the stencil and then the poly. When I brushed on my first coat of poly there was still a little sawdust on the wood (since I didn't wipe it fully) and it gave the white paint a little rustic look, perfect for what I wanted. 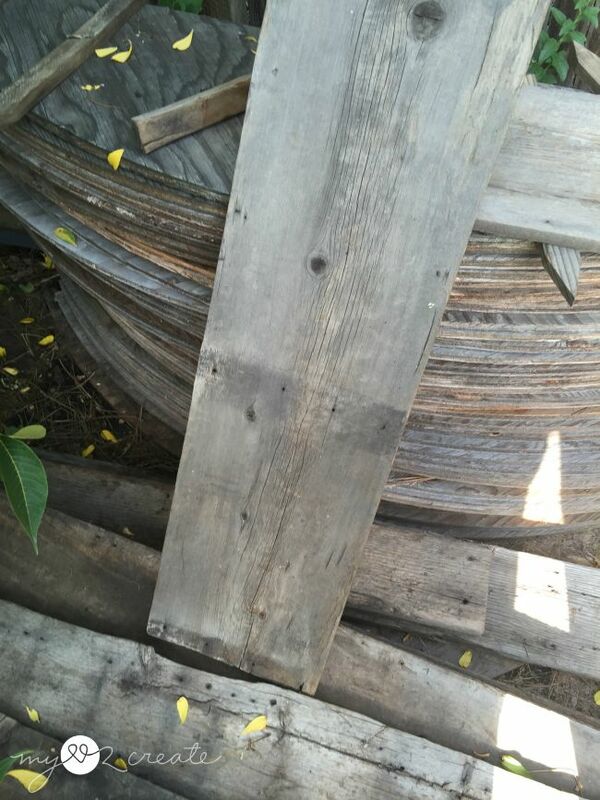 I am pretty sure this will only work on reclaimed wood, since it is weathered, but you could achieve a similar look with a dark wax. Or, you could check the free section on craig's list, people are always getting rid of old wood. I know Christmas is not here yet, but it is right around the corner...maybe someone you love has a medal collection that needs to be displayed? You can make the sign to fit any sport of hobby! This would be a great gift! 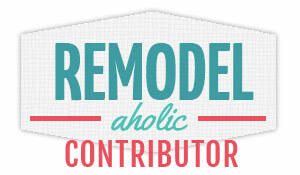 Do you know of someone that could use one? 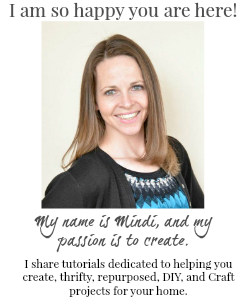 Beautiful job Mindi! And way to go hubs! 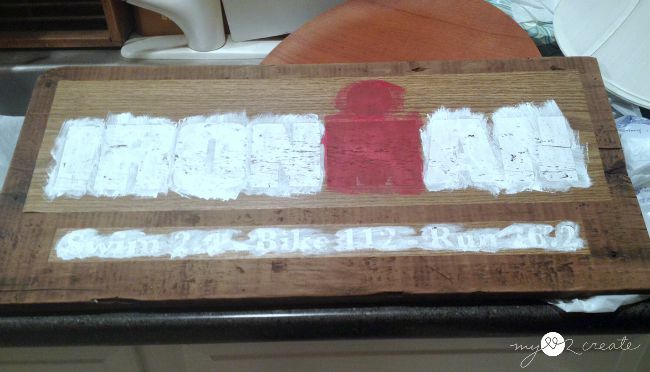 Every diy queen needs an ironman husband, right? ps loving the painter's tape! 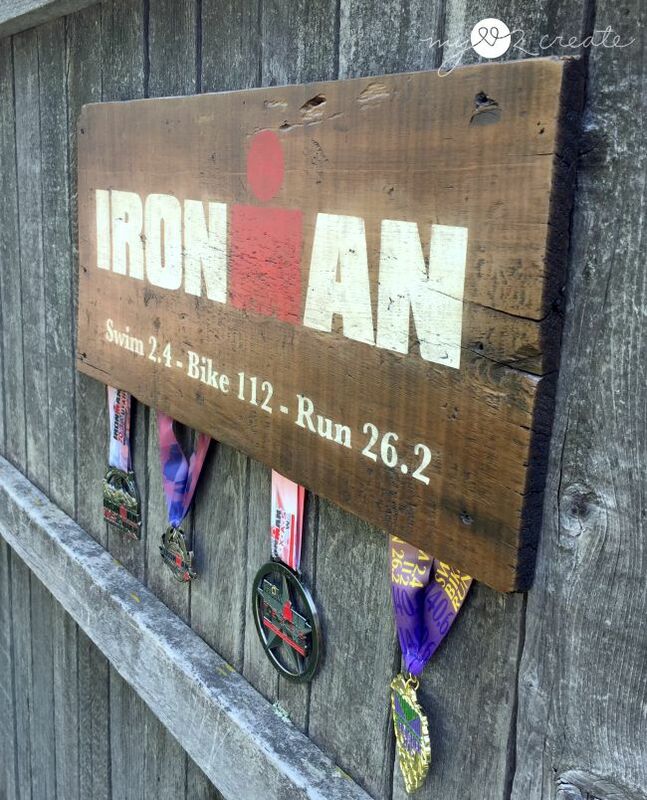 Wow, I've always thought that anyone crazy enough to do an ironman competition has to be a real die hard. lol! I love the rustic display! Thanks for sharing with SYC.